Last week, the United Nations Inter-agency Group for Child Mortality Estimation (UN IGME), which includes members from UNICEF, the World Health Organization (WHO), the World Bank Group, and the United Nations Population Division, released an important new study on levels and trends in child mortality around the world. The study presents several significant and encouraging findings, both from around the world and Eritrea, while also revealing a number of areas for improvement. Encouragingly, the report by UN IGME reveals that the world has made considerable progress in reducing child mortality since 1990. Specifically, the under-five morality rate has declined by 58 percent since 1990, while the number of under-five deaths dropped from 12.6 million in 1990 to 5.4 million in 2017. The under-five mortality rate expresses the probability (expressed as a rate per 1,000 live births) of a child born in a specified year dying before reaching the age of five. 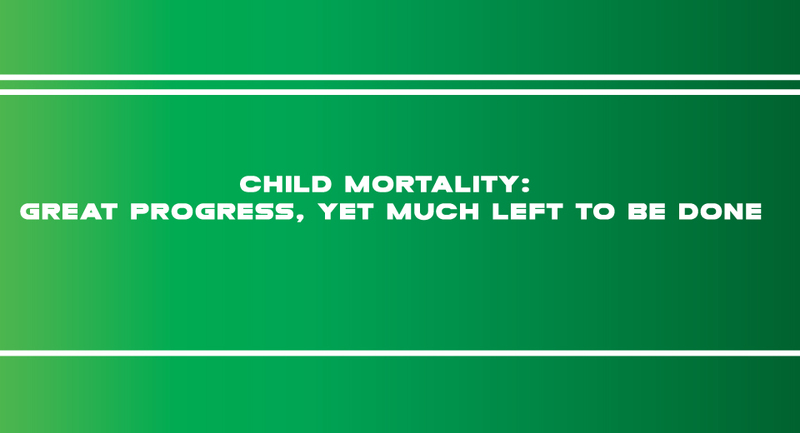 Despite the considerable progress made in child survival, the report also shows that child mortality rates are still shockingly high in some places. One highly troubling statistic is that a child under 15 dies every five seconds around the world. In 2017 alone, an estimated 6.3 million children and young adolescents died, mostly from preventable or treatable causes (such as complications during birth, pneumonia, diarrhea, neonatal sepsis, and malaria). Children under five accounted for 5.4 million of these deaths, with 2.5 million deaths occurring in the first month of life, 1.6 million at age 1–11 months, and 1.3 million at age 1?4 years. An additional 0.9 million deaths occurred among children aged 5?14. These deaths reflect the limited access of children and communities to basic health interventions such as vaccination, medical treatment of infectious diseases, adequate nutrition, and clean water and sanitation (UN IGME 2018). According to the report, children continue to face widespread regional and income disparities in their chances of survival. Globally, patterns of child mortality and morbidity show significant and persisting inequalities between and within countries, driven by poverty, social exclusion, discrimination, gender norms, and neglect of basic human rights. Sub-Saharan Africa remains the region with the highest under-five mortality rate in the world. In 2017, the region had an average under-five mortality rate of 76 deaths per 1,000 live births, which translates to 1 in 13 children dying before his or her fifth birthday. Comparatively, this is 14 times higher than the average ratio of 1 in 185 in high-income countries and 20 times higher than the ratio of 1 in 263 in the region of Australia and New Zealand, which has the lowest regional under-five mortality rate (UN IGME 2018). In regard to Eritrea, the report shows that the country has made substantial progress in improving child mortality and survival. Notably, Eritrea, which has an under-five mortality rate of 43.1, has the lowest under-five mortality rate in its region, one of the lowest rates in Sub- Saharan Africa, and a rate far below the continental average. Remarkably, across the time period under study (i.e. 1990-2017) Eritrea’s reduction in child mortality is amongst the highest recorded anywhere in the world. Generally, much of Eritrea’s progress in reducing child mortality has been associated with its practical, low-cost interventions delivered in an integrated, effective and continuous manner. For instance, Eritrea has greatly expanded access to antenatal care. While in 1991 the percentage of women who had made at least one healthcare visit during pregnancy was 19 percent, by 2013, the figure had dramatically increased to 93 percent. Other important steps taken include: offering obstetric care (Eritrea’s access to emergency obstetric care services increased from 21 percent in 1995 to 88 percent by 2013); increasing deliveries with skilled birth attendants (who can resuscitate newborns at birth); and ensuring good neonatal care (which involves immediate attention to breathing and warmth, hygienic cord and skin care). Providing skilled care to mothers during pregnancy, as well as during and after birth, has been particularly critical since more than one third of all child deaths occur within the first month of life. Furthermore, the early initiation of exclusive breastfeeding, the provision of antiretrovirals (ARVs) for women with HIV, providing vaccines, antibiotics, and micronutrient supplementation, and the distribution of insecticide-treated bed nets to prevent transmission of malaria have all contributed to the dramatic reductions in child mortality across the country. Importantly, Eritrea has also sought to address the interlinked root causes of child mortality, including poverty, malnutrition, gender inequality, harmful traditional practices, violence, stigma and discrimination, the denial of the right to safe drinking water and sanitation, the denial of the right to health (including lack of accessible, affordable and appropriate health services and medicines), and the denial of the right to education. The country’s broad range of educational programs and awareness campaigns have helped families and communities learn how best to bring up their children healthily and deal with sickness when it occurs. Additionally, Eritrea’s significant investments in developing and renovating roads and health facilities have greatly helped improve access to health services. In 2015, about 60% of Eritrea’s population had access to health care within 5km, while 40% had access to a health facility within a 10km radius. Of note, these figures have been further improved since then due to the continuing development of roads and health facilities across the country. As with the issue of education and literacy that I discussed last week, Eritrea’s notable improvements within child mortality are a clear reflection of the country’s firm focus upon and considerable investment in health. They exemplify the country’s strong commitment to its people and the protection and improvement of basic, fundamental human rights. And, to reiterate, these facts starkly contrast the persistent chorus of politicized accusations against the country. Generally, the discourse on Eritrea is sensationalist, one-sided, inaccurate, marked with half-truths and devoid of context or nuance, serving to characterize the country as an arena of barbarity and completely lacking in basic humanity. It ought to be recalled that the right to health is articulated in the WHO Constitution, which states that, “the enjoyment of the highest attainable standard of health is one of the fundamental rights of every human being,” while the Universal Declaration of Human Rights (UDHR), adopted by UN General Assembly Resolution 217A (III) of December 10, 1948, outlines that everyone has the right to health, including health care. In specific reference to child mortality, international human rights law includes fundamental obligations by States to address under-five mortality and morbidity as part of their work to ensure the child’s right to the highest attainable standard of health and other related rights. It also provides a legal framework for this work and a basis for accountability. Among the broad range of international human rights treaties relevant to child mortality and morbidity are: the Convention on the Rights of the Child; the International Covenant on Civil and Political Rights; the International Covenant on Economic, Social and Cultural Rights; and the Convention on the Elimination of All Forms of Discrimination against Women. These are complemented by countless documents on child health published by numerous organizations, such as the WHO, as well as general comment No.15 of the Committee on the Rights of the Child, general comment No. 14 of the Committee on Economic, Social and Cultural Rights, and general recommendation 24 of the Committee on the Elimination of Discrimination against Women.